Based on commercials on TBS, I've gathered that women's shaving cream contain lavender, mist and whispering, and men's shaving cream contains methane, a shot of whiskey and your dad telling you to man up. In reality, all shaving cream is the same. Barbasol understands that. It's cheap and functional which is why more women are starting to use it. However why does Barbasol say "shave like a man"? Why is shaving gendered at all? The unfortunate truth is everyone has hair. First we are going to make light of the difference (or lack thereof) between men's and women's products. Next. Get people to actively stop and think. When you walk down any product isle, they are always divided by a clear gender line. With shaving creme, you have men's dark, intimidating products next to women's bright and fruity ones. We are going to bring attention to this by placing our divide smack dab in the middle of the line. Pointing to Barbasol cans as they cross into the sacred men's and women's section. The website will prompt you to choose your gender for a more personal shopping experience. Both choices take you to the same page. Next step; Create Barbasol Households. The shareable two-pack. Since most men shave at the sink, and most women shave in the shower. Shaving at the sink is pretty simple. Shaving in the shower, not so much. Wet hands and feet make for more slips, cuts and fumbles than a Cleveland Brown's season. Introducing the No Slip Shower Grip line. 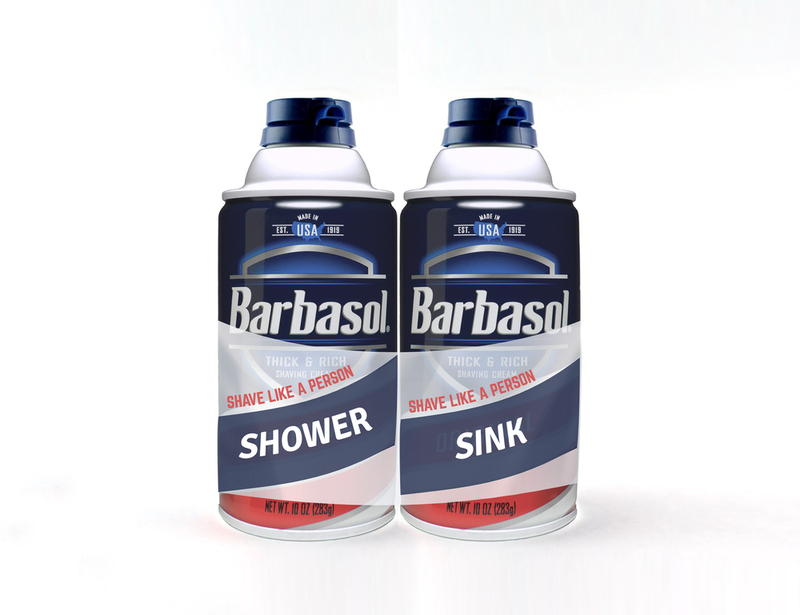 Barbasol currently sponsors sporting events. so it will continue in that vein by putting on a "public shaving" event in anticipation of the 2016 Olympics. Chosen athletes who often shave their bodies for better performance, will publicly shave to spark conversation. Posters promoting the event will feature the chosen athletes throughout the city. Highlighting the ridiculousness of the gender norms associated with shaving by quoting actual social media posts.